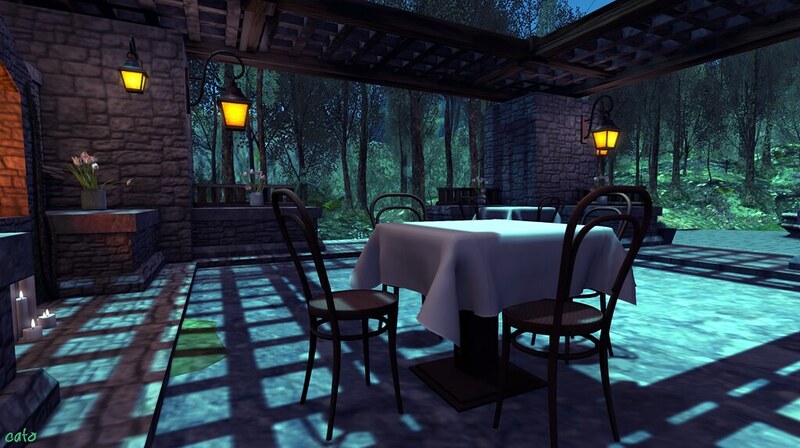 Usually I spent my saturday nights online in SL clubbing, dancing and hopping from party to party. But not tonight! After a lazy day, I continued being all mellow and went exploring instead of partying all the time. A lovely, well spent evening I may add…it can be so relaxing to fly around the virtual world, while in comfy yogapants, knitted socks and the oldest fleece sweater I could find (you know, that sweater I should have thrown away 8 yrs ago, but don’t and when I wear it I hope nobody shows up….) and a nice cup of warm Ovaltine – Ovalmaltine as it is called here. Err, I mean wine of course! Oops, almost blew my reputation! I explored a gorgeous, new to me, location: Less Than Three, owned by Kess Folkesson (kess.crystal) and Björn Folkesson and spent at least 3 hours looking around and taking pictures..and believe me, I could spend another 3 just as easy! Less Than Three <3 is a mix of rural landscaping and a touch of magic/fantasy and what is lovely for couples or dates: allover the place you will find purple mushrooms which are TIS dance balls! My pictures do not do this place justice, you really should go have a look yourself and enjoy it in the pixel! By accident, when zooming around, my camera got ‘locked’ on a sunbeam and while this usually annoys me when it happens, this time the effect was quite surprising and turned out to be a really cool shot. Of course I can not reproduce it, typical! So a lucky shot to end this blogpost and really….go visit Less Than Three <3! And if you are on Flickr, don’t forget to add your pics to the special group here! What I am wearing on the last, lucky, shot? The Allegria Penumbra Rogue outfit, available at the Fantasy Cacha Carnival, this is the Ultra-rare in Silver (more luck! ), my hair is ‘Kaya’ from MINA at Shiny Shabby.